There's a famous saying that goes, "The only permanent thing in the world is change". Your history book is one way to understand how time changes the world we live in, but there are also some real-life places that speak of the past in a much more impactful way. And most of them can be visited. Here’s a selection of some of the most creepily abandoned places around the world that you can take your next family trip to (if you can convince your parents) for us to experience and reimagine the way people used to live their daily lives then. Founded in the early 1900s by German settlers looking for precious gems, Kolmanskop was a small town in the heart of the Namib Desert. The surge of wealth gave out after the diamond fields started to deplete due to over-harvesting, and by the 1950s, the town was completely abandoned. After being left to the mercies of the elements, the place is now visited by photographers to capture photos of buildings with their insides often covered in sand blown in from the desert; in one of the most hauntingly beautiful ghost towns on earth. Opening in 1981, the headquarters of the Bulgarian Communist Party was the center of Bulgarian politics during the Soviet Era. But with the fall of the Soviet Union, the building soon went into disrepair and is now a ghost of its former glory. Looking like a shiny flying saucer, much of the building's roof has been stolen, leaving the inside often piled high with heavy snow from the Bulgarian winters. There has been talks to restore the building in an effort to increase tourism to the area, but the cost is currently too high for the government to do so. At the time being touted as the largest amusement park in Asia, and China's answer to Disneyland, construction to the Wonderland Amusement Park was abandoned in 1998 after a dispute over land prices. Some of the land was then used by local farmers to grow crops, but recent reports show that Beijing's economic boom will allow for tearing down of the abandoned park structures to make way for a brand new shopping mall. 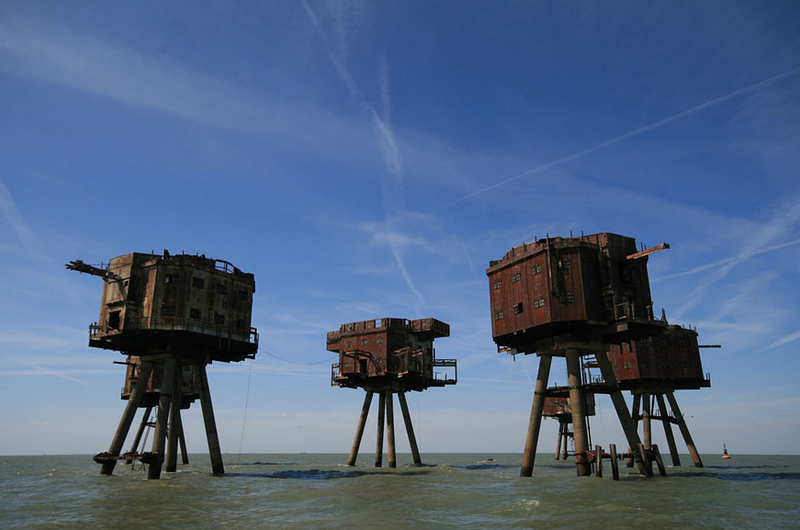 Looking like a scene straight out of a Star Wars movie, The Maunsell Sea Forts were erected near the Thames and Mersey rivers in Britain to station soldiers to help defend against potential German air or naval raids during World War II. After being decommissioned in the 1950s, they have been inhabited by a group of people claiming the forts as a new independent state, called the Principality of Sealand. They even have their own flag. Also known as the Island of the Dolls, this freaky island located on the outskirts of Mexico City is home to thousands of broken, worn out, and downright creepy dolls. The dolls hang from the trees, on walls and are seated on the grounds. The story goes that the island’s former caretaker discovered a dead girl in the island's canal. He began collecting dolls and hanging them up all around the island as a way to appease the girl's spirit. Bonus creepy story: In 2001, the caretaker himself was discovered dead in the exact spot that he claimed to have found the dead girl. Pripyat was built as a nuclear city. The name may sound familiar as it was the hometown of many workers who worked in the nearby Chernobyl nuclear power plant. The power plant famously exploded in the 1986 Chernobyl Disaster (one of the worst nuclear accidents in history). When the accident happened, the entire town had to be evacuated. The leak of nuclear radiation caused families to flee as fast as they could, leaving most of belongings behind. If you visit today, you can still find remnants of their lives such as children's toys and household items in relatively pristine conditions. Michigan Central Station was built in 1913 and was considers the tallest train station in the world at the time. After numerous planning mistakes and lack of funds, however, the station was closed in 1988. Much of the fine details that once characterized the building’s architecture have been either stolen or destroyed by vandals. Given the station’s place on the National Register of Historic Places, many are hoping that the building will be renovated. Estimates are that it would cost $110 to $300 million to restore the station, and up to today, the project never happened. Considering that trains are pretty much obsolete now, it's doubtful that the station will ever return to its former glory. Built in the 1800s, the Beelitz-Heilstätten hospital complex helped rehabilitate a great number of tuberculosis patients from the city of Berlin. The hospital was turned into a military hospital when World War I broke out, and Adolf Hitler himself recuperated from a leg wound there. During World War II, the hospital was occupied by Soviet forces, and it was officially abandoned in 1995 when the Soviets withdrew from it. Now, rusty hospital beds, vine-covered walls scrawled with graffiti and slowly peeling paint are what remains of it.